This article is about the unrecognized territory. For the people who claim it, see NunatuKavut people. NunatuKavut is an unrecognized Inuit territory in Labrador. The NunatuKavut people (also called Inuit-Metis or Labrador Metis) are the direct descendants of the Inuit that lived south of the Churchill or Grand River prior to European contact, with European influence from Basque and French whalers. Nunatuĸavut or NunatuKavut [ˈnuːnətuːhəvuːt] means "Our ancient land" in the ancestral Inuttut dialect of the NunatuKavummuit people. The Nunatuĸavut region encompasses Southern Labrador, from the Grand River south to Lodge Bay and west to the extent of the official border between Quebec and Labrador. However, the land use area is much more extensive. The area was known as Markland in Greenlandic Norse and its inhabitants were known as skrælingjar. In 1652, an Inuit community was recorded in what is now the Côte-Nord region of Quebec. In 1659, Jacques Fremin described an Inuit community at Cape St. Charles. Louis Fornel named the area from Alexis Bay to Hamilton Inlet the "Coste des Eskimaux" in 1743 and claimed there was Inuit living around St. Michael's Bay ("Baye des Meniques"), Hawke Bay, Martin Bay and Hamilton Inlet. Labrador's boundary according to the Canadian government before 1927. In 1763 Labrador was ceded to the Colony of Newfoundland. It included coastal area between the St. John's River and Cape Chidley and was meant as extra fishing grounds for Newfoundland fishermen. Labrador has been created using territory from the French colony of New France and the British colony of Rupert's Land. The inland boundary of Labrador was undefined until 1927 so Canada claimed the interior of Labrador as part of Quebec and the Northwest Territories while Newfoundland claimed that Labrador extended far inland. Labrador was ceded back to New France (now Lower Canada) and Rupert's Land in 1791 but then in 1809 it rejoined Newfoundland. In 1825 Blanc-Sablon and territory to the west was ceded to Lower Canada however this region (Le Golfe-du-Saint-Laurent Regional County Municipality) remains culturally close to NunatuKavut. In 1764, Jens Haven arrived at Quirpon, Newfoundland and to Chateau Bay. He was a missionary from the Moravian Church. Haven learned the Inuit language and explained to them that the Colony of Newfoundland wished to enter a peaceful relationship with them. Haven had previously worked in Greenland which is where he learnt the Greenlandic language (which is a similar language to the Inuttitut language spoken by Labradorian Inuit). In 1765, Governor Sir Hugh Palliser signed the "Labrador Treaty" with Inuit leaders at Chateau Bay. The British would protect Labrador from French and American influence while the Inuit would have the right to self-government, harvest of wildlife and natural resources. The Inuit had sided with the British during the Seven Years' War and fought a battle against the French and Innu at Battle Harbour. The Inuit had previously had a poor relationship with the French. In 1741, the Inuit revolted against the French at Cape St. Charles. The Inuit were also known to attack Basque fishermen around the Strait of Belle Isle. The 1765 treaty ensured a peaceful relationship between the Inuit and the fishermen from England and Newfoundland. The Moravian Church set up missionary posts in northern Labrador since the British hoped to colonize the south. They restricted access by Europeans to territory between Cape Chidley and Cape Harrison which created a cultural divide between the Inuit of the north and the Inuit of the south. The Moravians established one post south of Cape Harrison which was at Makkovik however a large number of the Inuit in Makkovik were mixed race similar to the ones in the south. European influence in the southern part of Nunatsiavut is still notable today as common surnames in Postville, Makkovik and Rigolet are mostly European names such as "Anderson", "Baikie", "Broomfield", "Jacque", "Michelin" and "Williams" while common surnames in Nain and Hopedale (both north of Cape Harrison) include "Aggek", "Ikkusek", "Karpik", "Okkuatsiak" and "Pamak". A former Newfoundland Ranger Force detachment in Port Hope Simpson. Birchy Cove, Labrador in 1908. North West River in 1894. In 1810, an Englishman named William Phippard married an Inuk woman named "Sarah" and they had a son. Some other English fishermen started marrying Inuit woman as well during this time. They were later joined by large numbers of fishermen from Conception Bay and Trinity Bay (who were mostly of English and Irish descent). Many Inuit in southern Labrador took European names. Some of them used anglicised surnames such as "Paulo", "Kippenhuck", "Shuglo", "Tuccolk", "Elishoc", "Alliswack", "Penneyhook", "Tooktusheena" and "Maggo" ("Kippenhuck" and "Toomashie" are the only remaining Inuit surnames (excluding names of people that have moved to NunatuKavut from other places), ("Penneyhook" has become "Penney"). In 1824, it was recorded that the population around Lake Melville consisted of 160 Inuit, 90 European settlers and 60 "half-breeds" (people of European and Inuit descent). Of marriages recorded between 1773 and 1891 in southern and central Labrador, it was shown that 152 married people were Inuit, 27 were European, 14 were mixed and 1 was Mi'kmaq while the ethnic origin of 26 people could not be identified. The racial composition of southern Labrador during the 1800s was a mix of the Inuit and English settlers while the north remained Inuit dominant. The culture of southern Labrador was (and remains) a unique blend of Newfoundland's Celtic-influenced culture and the native Inuit culture. The 1935 census showed that almost every resident of Labrador between Cape St. Charles and Cape Harrison had some Aboriginal background. Newfoundland exerted significantly more control over Labrador than Canada did over its northern regions. The Newfoundland Ranger Force enforced colonial laws in Labrador like it also did in rural Newfoundland. Battle Harbour, a resettled community near Mary's Harbour. In 1946, the Dominion of Newfoundland conducted an election to choose delegates for the Newfoundland National Convention. This was the first time that an election was held in Labrador and Lester Burry of Bonavista Bay was elected to represent Labrador. Burry wanted the Dominion of Newfoundland to become a province of Canada and in 1949, Newfoundland became Canada's 10th province. Before confederation, most Inuit lived in small settlements of a few families in isolated harbours and on islands off the coast of Labrador. During the 1950s and 1960s many communities across the province was resettled to larger population centres as part of a provincial government-sponsored program. The collapse of the Atlantic northwest cod fishery also had a huge impact on NunatuKavut like it had on the province as a whole and many people left the province to find work elsewhere. In 2002, a gravel road opened between Red Bay and Cartwright. This road was later extended to reach Happy Valley-Goose Bay. If NunatuKavut was recognized as one of Canada's Inuit regions by the Inuit Tapiriit Kanatami, then it would be the only one with a highway network reaching most of its communities (the town of Inuvik is connected to Yukon by road and is the only recognized Inuit community that is accessible by road). NunatuKavut claims to represent 6,000 Inuit covering a third of Labrador's landmass. It is more densely populated than Nunatsiavut or any other Inuit region. Many residents of anglophone communities in northeastern Quebec (between the Natashquan River and the Strait of Belle Isle, sometimes called the "forgotten Labrador") claim a similar Inuit and European heritage as the people of NunatuKavut. 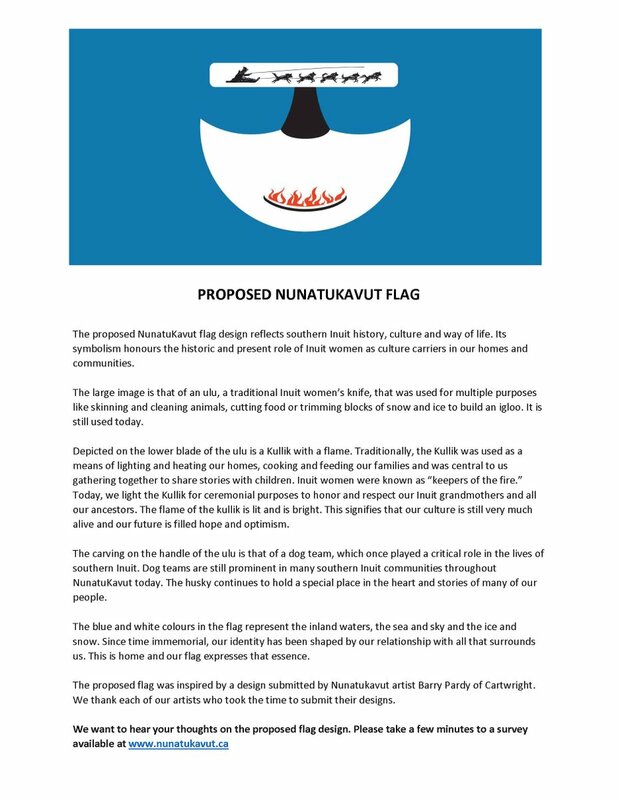 In 2016, the NunatuKavut Community Council unveiled a proposal for its flag. The flag was designed by Barry Pardy of Cartwright. In the late 1970s, the Labrador Metis Association was created by the inhabitants of Labrador's southern coast to gain recognition as a distinct ethnocultural group, as at the time despite a pre-existing treaty protected under the constitution, the "Inuit-Metis" were considered to be merely the descendants of Inuit who had joined Western society. Little was known about the history of the "Inuit-Metis" of the time. In 2006, the Labrador Metis Association initiated a project with Memorial University to better understand their past through the Community-University Research Association (CURA). Following research by CURA, the "Labrador Metis" were understood to be a continuation of the Inuit people of southern Labrador. The Labrador Metis Association promptly changed its name to reflect their newly discovered heritage, and became the NunatuKavut Community Council. In an effort to enforce the treaty of 1765, NunatuKavut launched a land claim with the federal government that is currently being negotiated. As a part of this land claim, the NunatuKavut Community Council asserts that the Muskrat Falls and Lower Churchill hydroelectric project fall on their territory.